Settler = The person setting up the trust and putting their assets in to the Trust. ASSET PROTECTION TRUSTS are used to ‘ring fence’ assets providing peace of mind that the assets are protected to provide for chosen beneficiaries. Asset protection trusts are a lifetime settlement used to provide for a surviving spouse and future generations and to attempt to protect hard earned assets against the possible claims of third parties. 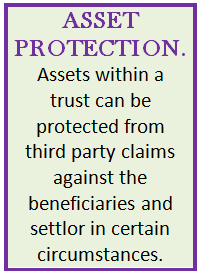 The asset-protection trust is a trust that splits the beneficial enjoyment of trust assets from their legal ownership. The beneficiaries of a trust are the beneficial owners of equitable interests in the trust assets, but the legal title to the assets is held by the trustees. Placing assets within a trust protects them from ‘sideways disinheritance’, claims upon the divorce or bankruptcy of a beneficiary and can save Inheritance Tax (IHT) on a beneficiary’s estate by retaining assets within the trust and passing them directly to future generations. 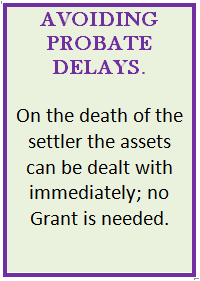 Further, probate fees can be mitigated or avoided as the assets within the trust are not part of the estate for distribution or probate purposes. This also means that they are protected from any claim under the Inheritance Family Provisions legislation. 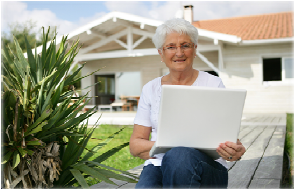 A couple can transfer the family home into a trust and continue to live there for the rest of their lives. The death of the first spouse to die will not affect the right of the surviving spouse to occupy the home. The equity of a property which is subject to a mortgage can be placed within a trust and secured by a restriction on the land registry title without needing the consent of the lender. 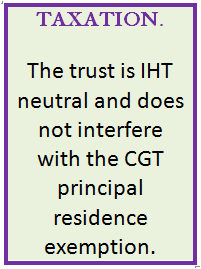 It is not just the family home which can be put into the trust. Other assets such as building society accounts, bank accounts, stocks and shares can be placed into the trust for the use of the settlor and surviving spouse during their lifetimes and for other beneficiaries after the death of the survivor. Income and capital can be paid to the survivor for his or her welfare at the discretion of the trustees. 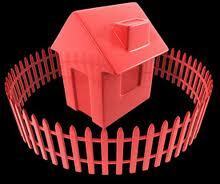 Taxation: – The purpose of the trust is not to mitigate or avoid inheritance tax but to protect and preserve assets. It is IHT neutral in this respect and does not remove the value of the assets from the IHT calculation on death if the settlors continue to receive a benefit from the assets. The principal residence exemption for Capital Gains Tax will continue to apply to a property held in trust as long as the settlors continue to occupy it as their principal residence. Care fees:- Clients often ask whether asset protection trusts can protect against care home fees. The fear is that the family home will be taken from them and sold so that nothing is left for future generations. This is a complicated topic and involves consideration of the concept of ‘deliberate deprivation’. Any act carried out whereby assets are transferred, sold or used up deliberately to diminish the settlor’s assets to avoid paying care fees can be considered as deliberate deprivation. If assets are transferred into an asset protection trust whilst care fees are not even contemplated and when the clients are healthy and not considering going into care the assets may be excluded from a local authority assessment for care fees. A full assessment of the settlors’ circumstances will be required to provide full and accurate advice in this respect.